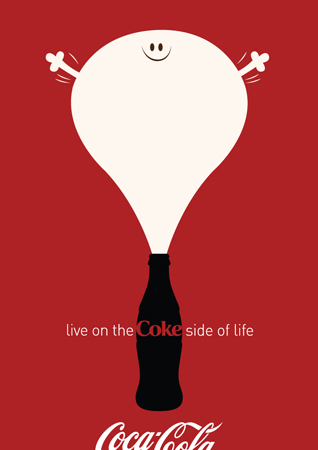 “I used the eye from my logo to create a bizarre version of the “traditional” Coke Side of Life ads”. 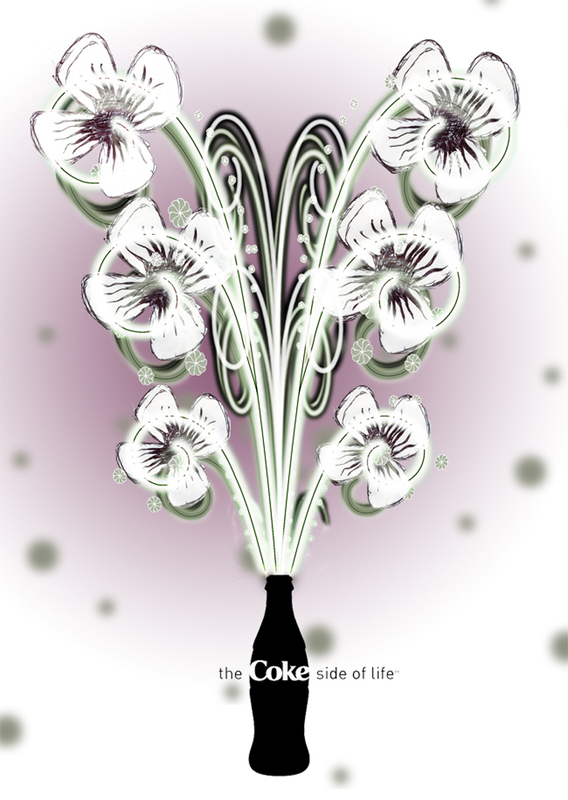 “I hand drew the flowers and traced them in Illustrator before playing with them in Photoshop”. Armslikenoodles is not so secretly Matt Allison, a Bedfordshire/Leicester based designer who tends to draw a lot and make websites. His work is playful, colourful & stylish – creating realistic portrait illustrations, t-shirts, badges & just about anything else you can slap a line, shape or character on. PS: Matt doesn’t really have arms like noodles. In this video you can see Blake and his team creating the 7m high work of art on the SouthBank. 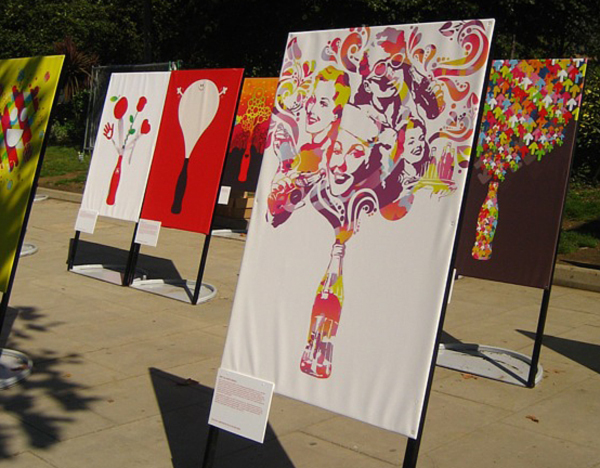 Blake’s enthusiasm for the project shows in his large-scale piece; it is at once an icon for Coke and for his signature style. The Southbank of the River Thames is one of London’s most vibrant locations; jugglers, mime artists, silver human statues, this place has got the lot. 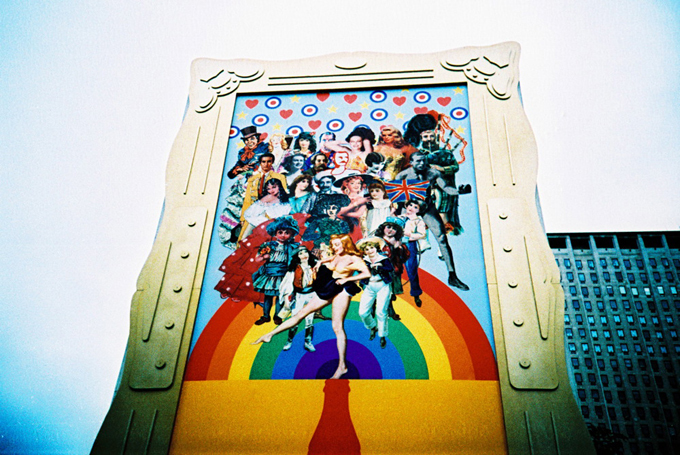 But what would happen it you added the Godfather of UK Pop Art and creator of the legendary Sgt. Peppers album cover, Sir Peter Blake? Photography by Russell+, Flickr. All Rights Reserved. 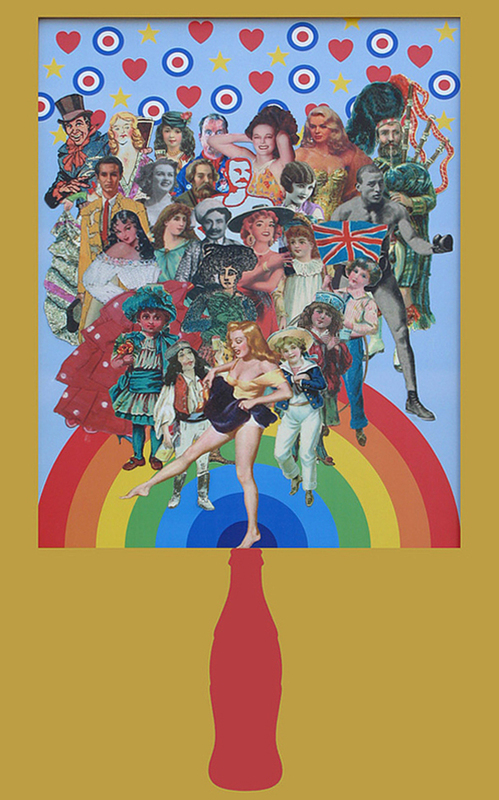 Last Summer, Sir Peter Blake has been commissioned by Coca-Cola UK to create a stunning piece of pop art celebrating “Summer on the Coke Side of Life”. Here you can see the end result. Photo by Slimmer_Jimmer, Flickr. All Rights Reserved. 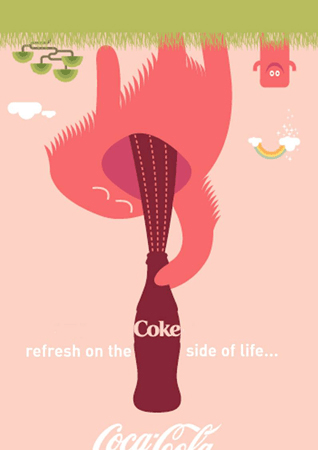 For the Coke Side of Life Remix Art Gallery, RockAndRoll Agency creatively managed 15 artists/agencies/collectives from around the world: Idokungfoo, Japan // Vault49, USA // Caos CC, Spain // Adhemas, Brazil // 013a, Romania // Creative XL, India // Extraverage, Hungary // Buro Destruct, Swiss // Mienandi, Senegal // The Designers Republic, UK // Rex (South Africa) // Todd Alan Breland (USA) // Spinbalon, Venezuela // Pixecute, Indonesia // Armchair & Josh Boston, USA // Fung Wee Lim, Canada. 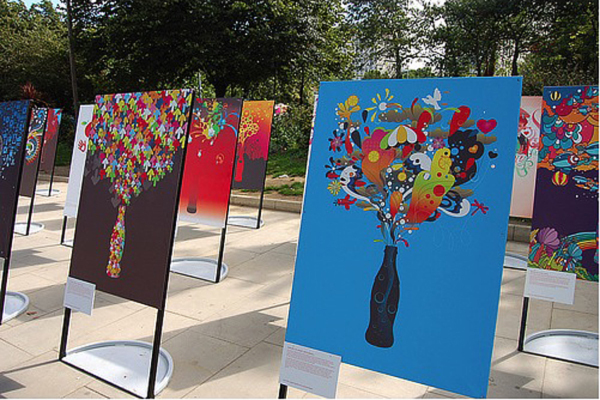 Here you can see their artworks exposed on the SouthBank, London, UK. 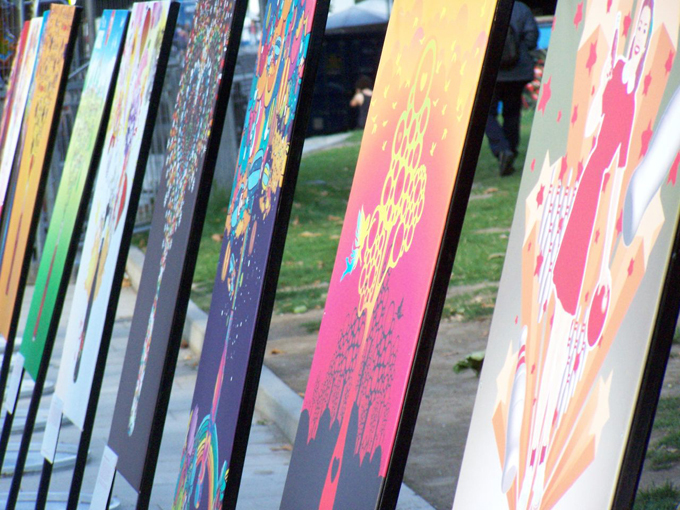 The work of the Remix artists reflects various styles, personalities and cultures and the project shows how vibrantly creative the collaboration of a design network can be. The diverse backgrounds of the contributing artists have resulted in a multifaceted world of imagery that draws its freshness from the mixture of approaches. 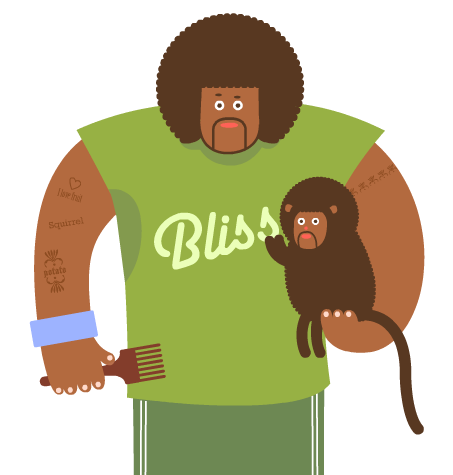 Their mission is to spread an optimistic look at the world and help people realize how contagious happiness is. 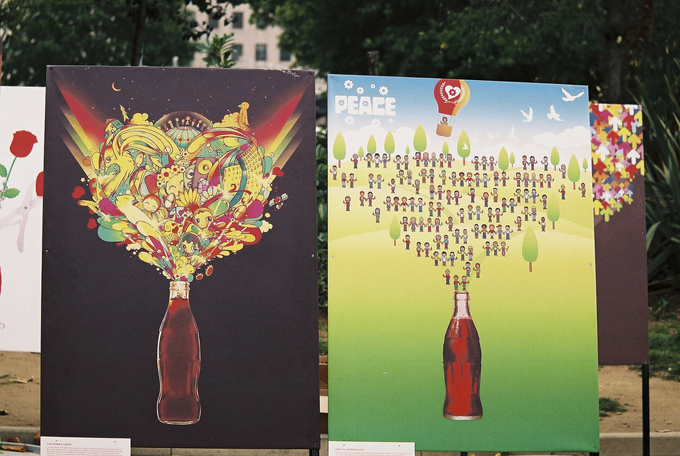 By combining iconic Coca-Cola images with up-to-date illustration techniques and styles, the artists have given rise to a progressive style of visual expression. 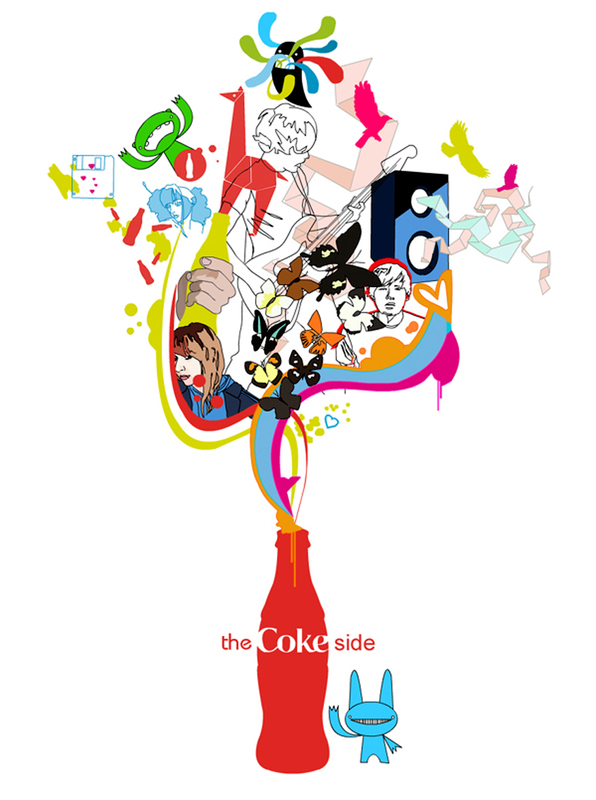 Designed within the “Coke Side of Life” concept and format, the Remix artworks are colorful explosions of positive thinking. 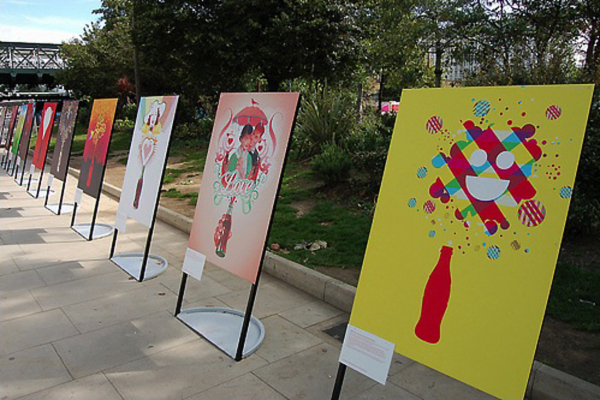 The experimental, playful and humorous collages of historical Coca-Cola milestone images are a true tribute to the brands unique and undying creative spirit. Photography by RWDave, Russell+, Slimmer_Jimmer, Simpson_eh, Bergs Eye View, Hallywoods, Owizard (Flickr). All Rights Reserved. RockAndRoll Agency is a full-cycle communication agency offering marketing services, strategic development and art direction. 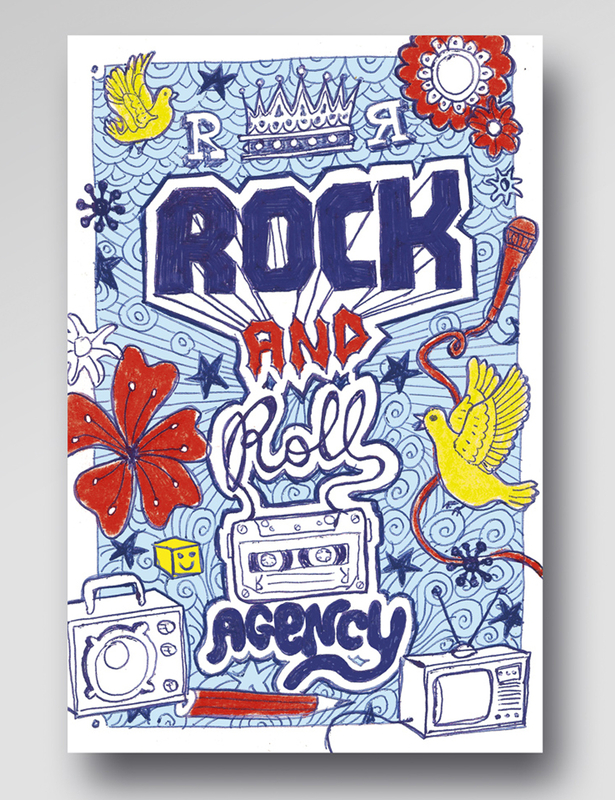 RockAndRoll Agency was founded in 2003 by Jean-Philippe Noterman and Wouter De Coster. Jean-Philippe studied philosophy/anthropology, Wouter has a background as fashion designer. 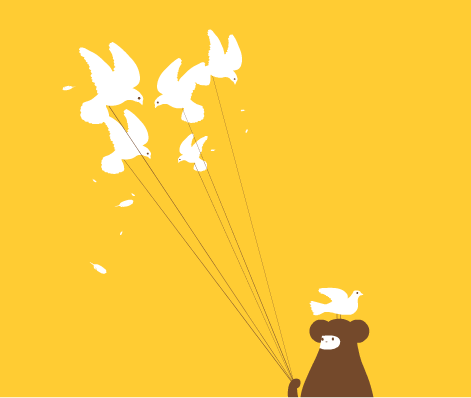 Before starting RockAndRoll Agency, they worked already together for 5 years in the publishing and communication business. RockAndRoll Agency is dedicated to the production of visual identity design, graphic animation and websites. As art buyers and curators, RRA is always looking for artists with strong ideas and an individual voice. 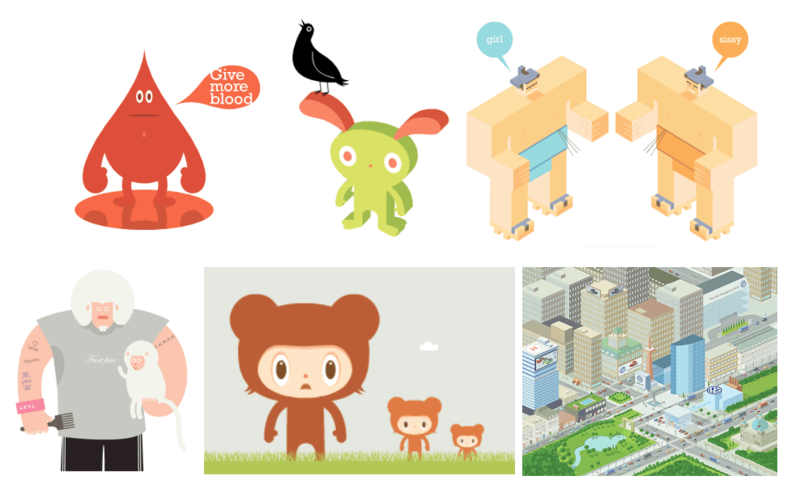 Illustrator and designer Simon Oxley lives and operates from his wife’s hometown of Fukuoka, Japan. 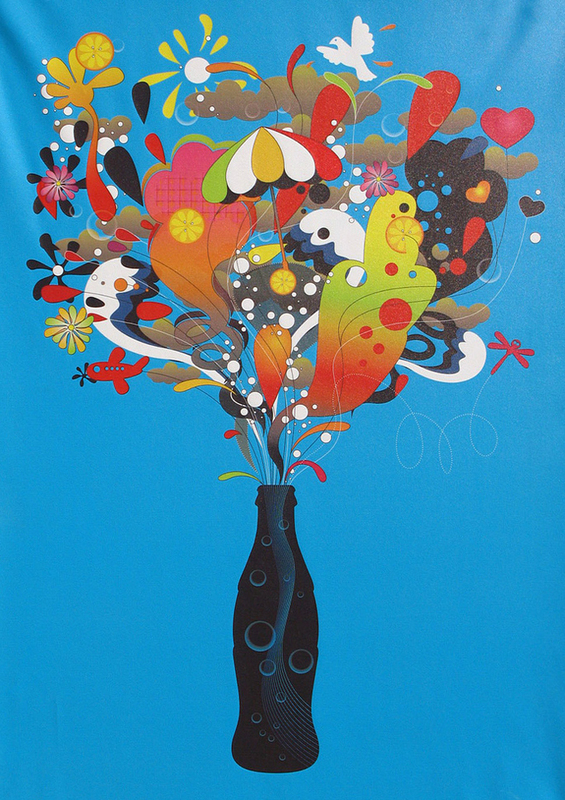 From 1986 to 1989 Oxley attended college in the UK, studying graphic design, photography, drawing and typography – a solid basis for what he has been doing as a job ever since. In the early 90s he spent a lot of time making pseudo artistic paintings hoping these would become the next big thing and appear in the best galleries worldwide. Sadly, this was not the case and Oxley ended up giving them to friends as Christmas and birthday presents – lucky people! 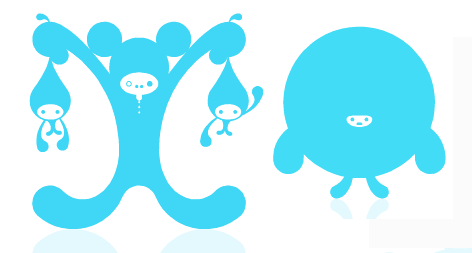 In 1997 Oxley moved to Japan to work in a design company based in Harajuku. Since 2002, Oxley has run his own design and illustration studio, Idokungfoo, and works for clients from all over the world. His future goals include writing stories which he can illustrate with his famous characters / producing films which include original scores produced by simple means (amateur sound recording equipment and the help of friends) / making new merchandise which features his images / opening a store which offers all Idokungfoo products and all the other things he likes. 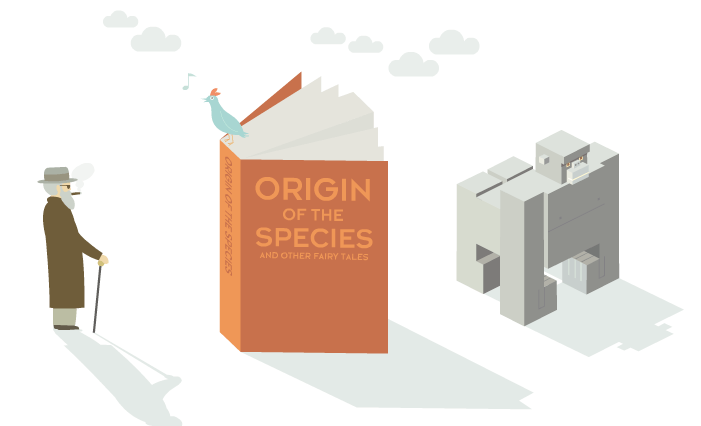 Since 1989, when I left Graphic design college and found employment at a computer game production company – I designed and artworked the cassette inserts. DID IT TAKE LONG TO FIND YOUR PERSONAL STYLE? This is basically something I cannot pin down to one thing…. WHAT’S YOUR ULTIMATE DREAM PROJECT AS AN ARTIST? It is my goal to own a shop someday, selling strange curiosities which appeal to all ages. 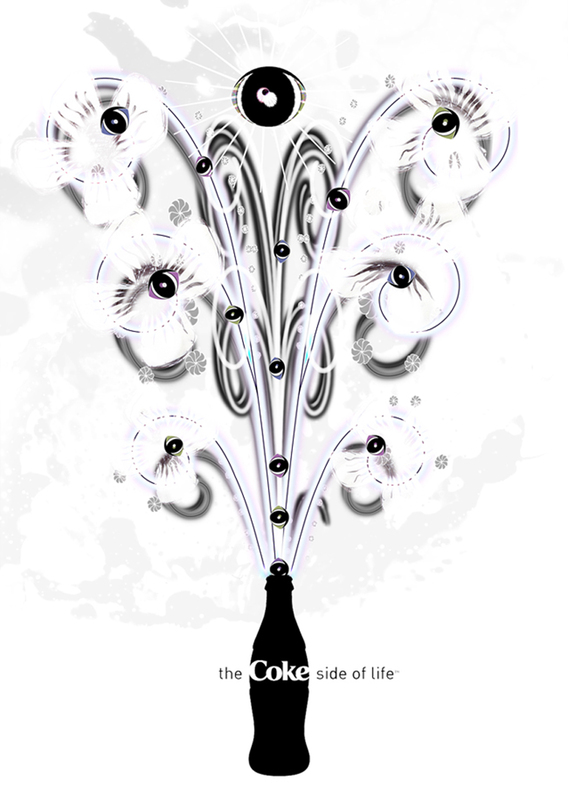 HOW DID YOU COME UP WITH THE IDEAS BEHIND YOUR ‘‘COKE’ SIDE OF LIFE’ REMIX POSTERS? 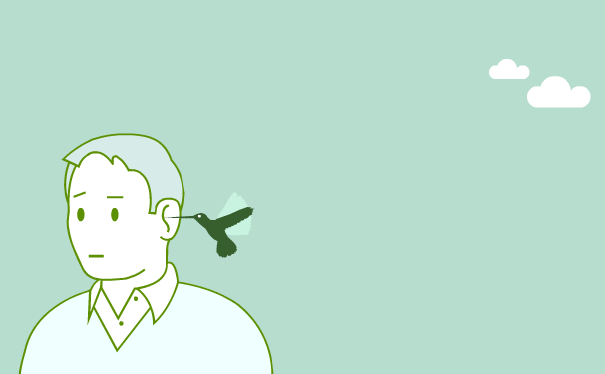 I like to work spontaneously – so just see what happens as I draw. A shape will evoke a direction, as will a word or phrase. I spend a lot of time writing phrases which come to mind – these help to create a story line to guide the visual direction I take. HOW DID THE ‘COCA-COLA’ HISTORY AND THEMES INFLUENCE YOUR REMIX WORK? 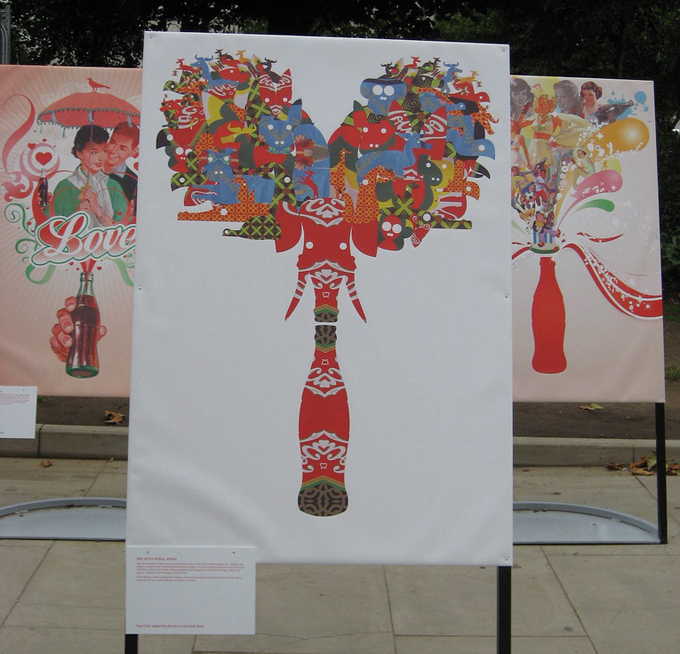 Being 38yrs old I can recall many ‘Coke’ campaigns – Coca Cola is an iconic part of many cultures. I chose the Christmas theme instantly, since I felt my imagery would work best with this festive theme. I also remembered that the common image we have of Santa Claus in the red costume originated from the early ‘Coke’ campaigns – which I still find extraordinary! CAN YOU GIVE SOME BACKGROUND INFORMATION ON YOUR FAVOURITE REMIX ARTWORK? The large bubble character blowing up out of the top of the bottle is my personal favorite. Maybe it’s the simplicity of form – or just the innocent expression of fun which I like to think ‘Coke’ pursues. My wife and I have two young sons, so much of my time is spent playing with them – seeking out natural and cool locations in the mountains or shopping in malls on rainy days. Illustration is not really work for me, I often draw with the children, teaching them at the same time. I also spend a lot of time producing photographic and vector imagery for iStockphoto.com picture library. 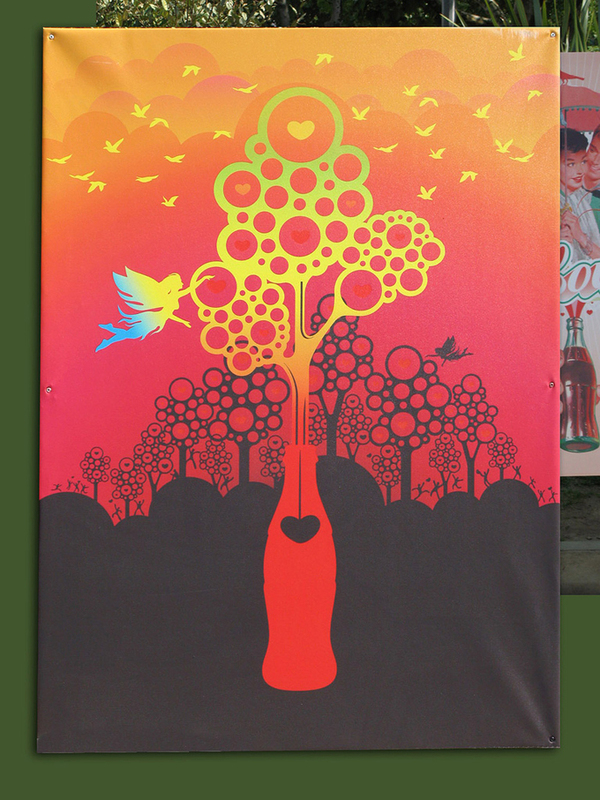 WHAT WAS YOUR FIRST IDEA FOR THE INTRINSICS POSTERS YOU DESIGNED FOR ‘COCA-COLA’? I wanted to make something simple visually – not clutter the space too heavily and risk producing a wallpaper pattern in the triangular area made available above the iconic bottle silhouette. WHAT WOULD YOU LIKE TO ACCOMPLISH AS A DESIGNER? I would like to make people feel happy, laugh, become curious, question everything they believe, discover renewed enthusiasm for life and generally feel encouraged by a sense of variety which the world has to offer us. ANY INSIGHTS IN YOUR CREATIVE PROCESS? Keep thinking and recording thoughts however obscure. Many times an apparently weak idea can work depending upon the method of interpretation. Also, I find it important to take breaks: stay away from computers for a few days sometimes, wander around a fish market, go to the countryside and watch people ploughing fields… basically remove myself from my cozy bubble. DO YOU START SKETCHING ON PAPER OR DO YOU WORK DIRECTLY ON THE COMPUTER? I enjoy sketching and brush and ink painting – but only occasionally I scan these in to work from. It is true that the hand drawn line contains way more character than a computer stroke, although the computer stroke has its own personality which I like also. It is easy to manipulate parts of an image to create a result which is not preconceived. YOUR IMAGERY SEEMS LIKE TO TELL A STORY EACH TIME. DO YOU HAVE THE STORY IN YOUR HEAD FIRST OR DOES IT COME GRADUALLY WHEN YOU START ILLUSTRATING? I treat all my images as frames in a storyline, but I enjoy the moment before something is about to happen – or an ordinary moment which people may be surprised to find illuminated. I try really hard to empty my head of the piles of past visuals I have buzzing around, trying to influence the story I am making. This is the hard part. 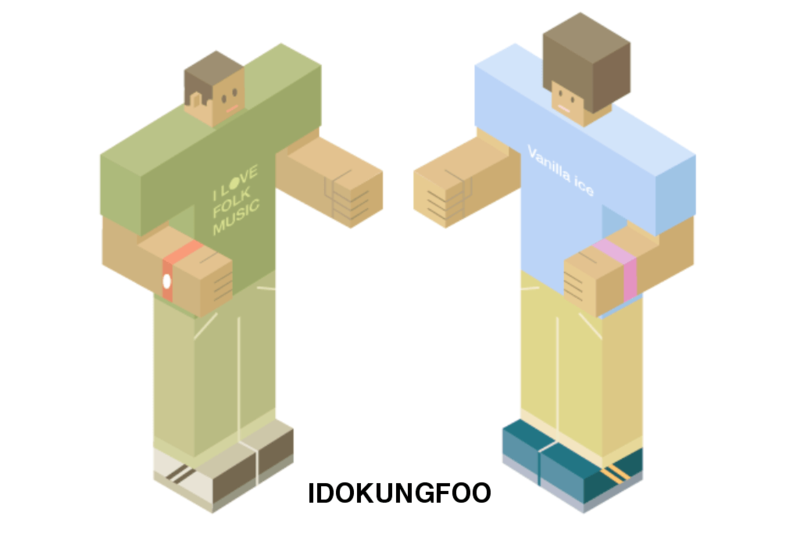 IF THERE WAS AN IDEAL IDOKUNGFOO WORLD, HOW WOULD IT LOOK LIKE? It would be a world covered in fake fur so no-one would get grazed knees ever again falling on concrete. 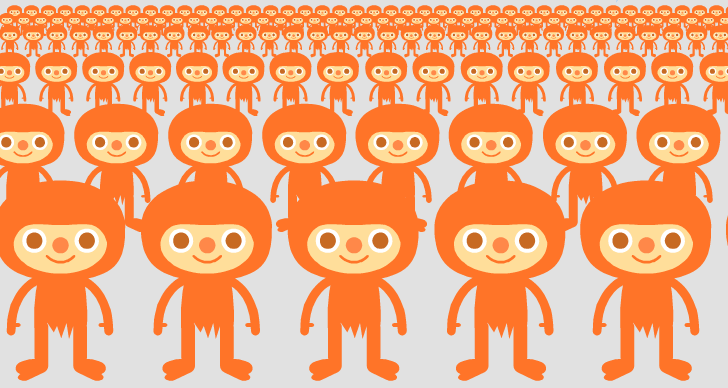 There would be large shiny animated statues of characters everywhere which everyone could climb on, through and over.